Surveys concur that adolescents disproportionately engage in many real-world risk behaviors, compared with children and adults. Recently researchers have employed laboratory risky decision-making tasks to replicate this apparent heightened adolescent risk-taking. This review builds on the main findings of the first meta-analysis of such age differences in risky decision-making in the laboratory. Overall, although adolescents engage in more risky decision-making than adults, adolescents engage in risky decision-making equal to children. However, adolescents take fewer risks than children on tasks that allow the option of opting out of taking a risk. To reconcile findings on age differences in risk-taking in the real-world versus the laboratory, an integrative framework merges theories on neuropsychological development with ecological models that emphasize the importance of risk exposure in explaining age differences in risk-taking. Policy insights and recent developments are discussed. 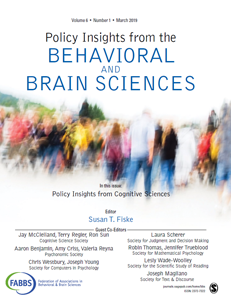 Click here to read the full article from Policy Insights from the Behavioral and Brain Sciences.